Mad River founder, Roland Palmedo, began what was then called, The Father/Son Race at Stowe with his colleagues in 1947. In 1952 the event moved to his new ski area, Mad River Glen. 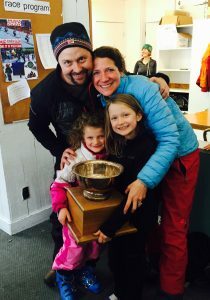 Over the next 5 decades the event has evolved (and become more politically correct) into the Mad River Glen Family Tournament. and, of course, the overall Family Winner.